We offer recreational and competitive musical theatre classes at the studio. This class combines dance, acting, and singing and does not really have age breakdowns or levels as students learn mini theatre-inspired routines for the year-end showcase and/or competition. Classes throughout the season vary from learning dance technique to theatre sports and pantomime practice. Students in our recreational musical theatre program may be divided into classes based on age due to the content of the music or choreography. Students in our competitive dance classes are grouped based on the artistic concept for the upcoming season. 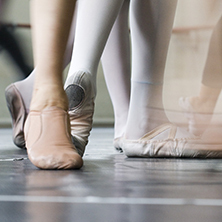 ** Students in competitive classes may be required to purchase a different shoe based on the content of the choreography and the character being portrayed.